Today one word stands out in the bathroom experience, luxury. An increasing number of homeowners are undertaking bathroom remodeling projects to create more than just a utilitarian space. 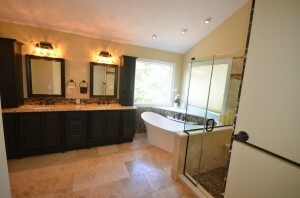 Bathrooms today are made to be a place of luxury; your own private retreat to relax and unwind. There are many incredible new luxury features available to you such as heated towel racks and floors. Beyond simply upgrading your bathroom design for luxury, however, a renovated bathroom is always a good investment as it can increase your home’s resale value. Below are some of the current trends in bathroom design. Showers are getting more luxurious and spacious. Even in small bathrooms, a number of homeowners are opting to tear out the bathtub to expand the shower. Stalls are getting larger and more airy and much more glass is being included in bathroom remodeling projects. Lighting is a key component to any bathroom design. A lot of individuals want their bathrooms to be more sun-filled and brighter than before. This includes the addition of windows and skylights to the space. There are also beautiful lighting options that can accentuate and modernize your bathroom’s look. While some people are removing tubs, there is also a growing number of people that are going for the serene experience of soaking tubs. These tubs are typically deep, insulated and are noticeably missing the prominent decking that seemed synonymous with bathtubs in the 1980s and 1990s, providing a more streamlined look. If the bathroom is spacious enough, people often will upgrade both their shower and tub, creating the ultimate getaway.